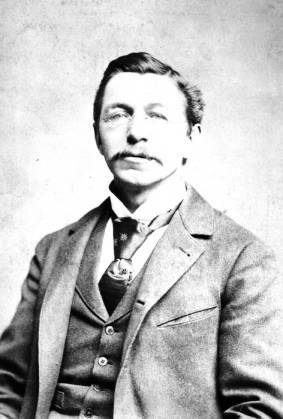 Labor leader Jacob S. Coxey as a young man, ca. 1894. The Panic of 1893 was a national economic crisis set off by the collapse of two of the country's largest employers, the Philadelphia and Reading Railroad and the National Cordage Company. Following of the failure of these two companies, a panic erupted on the stock market. Hundreds of businesses had overextended themselves, borrowing money to expand their operations. When the financial crisis struck, banks and other investment firms began calling in loans, causing hundreds of business bankruptcies across the United States. Banks, railroads, and steel mills especially fell into bankruptcy. Over fifteen thousand businesses closed during the Panic of 1893. Unemployment rates soared to twenty to twenty-five percent in the United States during the Panic of 1893. Homelessness skyrocketed, as workers were laid off and could not pay their rent or mortgages. The unemployed also had difficulty buying food due to the lack of income. Ohioans also suffered through the economic depression. At different points, the unemployment rates in Ohio reached fifty percent among industrial workers. Buckeye Mower and Reaper Company's owners sold the firm to a Chicago, Illinois, business. In 1894, Jacob Sechler Coxey, an Ohio businessman, organized a protest march of workers from Ohio to Washington, DC. Coxey hoped that this march would force the federal government to provide assistance to workers during the Panic of 1893. Coxey's Army, as it eventually became known, reached the nation's capital with only six hundred marchers. Local police arrested Coxey and the march's other leaders. The rest of the marchers quickly dispersed. The government refused to intervene. Fortunately for the United States populace, the Panic of 1893 ended by the end of 1897. Cashman, Sean. America in the Gilded Age. N.p. : NYU Press, 1993. Chandler, Alfred D., Jr. The Visible Hand: The Managerial Revolution in American Business. N.p. : Belknap Press, 1993. Murdock, Eugene. Buckeye Empire: An Illustrated History of Ohio Enterprise. N.p. : Windsol, 1988. Painter, Nell Irwin. Standing at Armageddon: A Grassroots History of the Progressive Era. N.p. : W.W. Norton, 2008. Porter, Glenn. The Rise of Big Business, 1860-1920. N.p. : Harlan Davidson, 2006. Steeples, Douglas, and David O. Whitten. Democracy in Desperation: The Depression of 1893. N.p. : Greenwood Press, 1998.